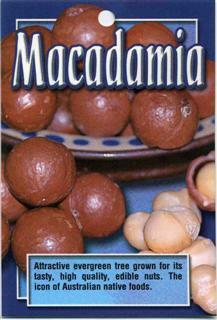 Attractive evergreen tree grown for its tasty, high quality, edible nuts. The icon of Australian native foods. • A4: Hybrid Aust. 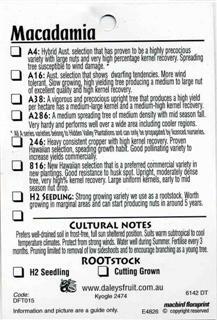 selection that has proved to be a highly precocious variety with large nuts and very high percentage kernel recovery. Spreading tree susceptible to Wind damage. • A16: Aust. selection g tendencies. More wind tolerant. Slow growing producing a medium to large nut of excellent quality and high kernel recovery. • A38: A vigorous and precocious upright tree that produces a high yield per hectare has a medium-large kernel and a medium-high kernel recovery. • A286: A medium spreading tree of medium density with mid season fall. Very hardy and performs well over a wide area including cooler regions . • 246: Heavy consistent cropper with high kernel recovery. 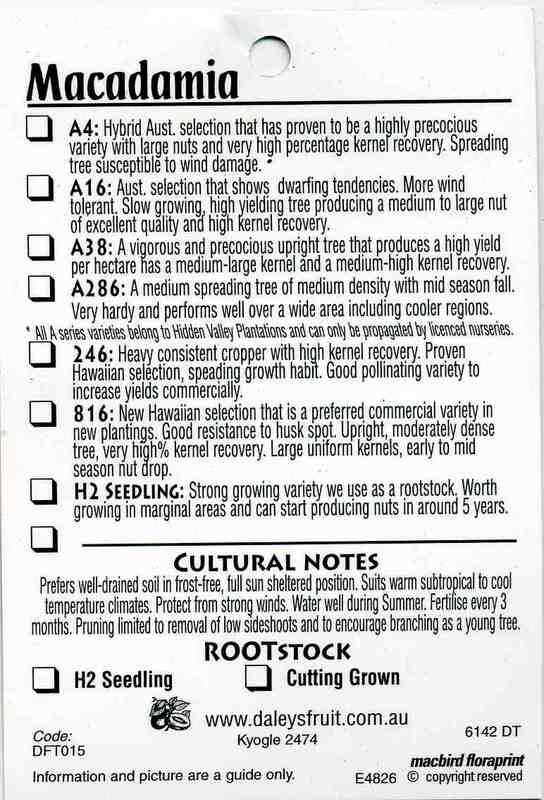 • 816: New Hawaiian selection that is a preferred commercial variety in new plantings. Good resistance to husk spot. Upright, moderately dense tree, very high % kernel recovery. Large uniform kernels, early to mid season nut drop. • H2 SEEDLING: Strong growing variety we use as a rootstock Worth growing in marginal areas and can start producing nuts in around 5 years. Prefers well drained soil in frost-free, full sun sheltered position. Suits warm subtropical to cool temperature climates. Protect from strong winds. Water well during Summer. Fertilise every 3 months. Pruning limited to removal 01 low sideshoots and to encourage branching as a young tree.